"Oldest Existing Illinois Capital City"
Location of Vandalia in Fayette County, Illinois. Vandalia is a city in Fayette County, Illinois, United States. At the 2010 Census, the population was 7,042. Vandalia is 69 miles (111 km) northeast of St. Louis, on the Kaskaskia River. 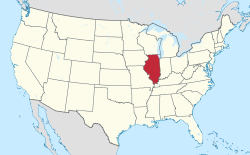 It served as the state capital of Illinois from 1819 until 1839, when the seat of state government moved to the current capital of Springfield. Vandalia was for years the western terminus of the National Road. Today, Vandalia is the county seat of Fayette County and the home of the Vandalia State House State Historic Site (1836). Madonna of the Trail statue in front of the Vandalia State House. Vandalia was founded in 1819 as a new capital city for Illinois. The previous capital, Kaskaskia, was unsuitable because it was under the constant threat of flooding. The townsite was hastily prepared for the 1820 meeting of the Illinois General Assembly. The history of the name Vandalia is uncertain. Different theories can be found in almost all of the books written about Vandalia over the years. In her book Vandalia: Wilderness Capital of Lincoln's Land, Mary Burtschi tells of a conversation between one of the original surveyors of the town and a Vandalia resident. The surveyor, Colonel Greenup, explained that Van was suggested by one of the men. He recommended this as an abbreviation to the word vanguard meaning the forefront of an advancing movement. Another suggestion was made for the term dalia, derived from the Anglo-Saxon word dale which means a valley between hills. Greenup takes credit in the conversation for connecting the two terms to form the name Vandalia. Another possible source of the name is the Vandalia colony, a failed attempt to establish a fourteenth colony in part of what is now West Virginia and Kentucky. The Vandalia colony was named in honor of Queen Charlotte, who claimed descent from the Wendish tribe of Obodrites, also called the Vandals. Another theory put forth is that Vandalia was named by those who located the state capital in the town; according to the story, they mistakenly thought the Vandals were a brave Native American tribe, rather than of Germanic origins. The law under which Vandalia was founded included a provision that the capital would not be moved for twenty years. Even before the end of this period, the population center of the state had shifted far north of Vandalia. In 1837, the General Assembly voted to move the capital to Springfield. On November 21, 1915, the Liberty Bell passed through Vandalia on its nationwide tour, while being returned to Philadelphia, Pennsylvania from the Panama-Pacific International Exposition in San Francisco. In 1900, 2,665 people lived in Vandalia; in 1910, 2,974; and in 1940, 5,288. The population was 6,975 at the 2000 census. Vandalia is home to the Okaw Valley Area Vocational Center, which trains high school students in vocational trades. It also serves vocational students from nearby high schools such as those in Greenville and Mulberry Grove. The building trades class at the center each year purchases property in Vandalia, builds a house, and sells the improved property. They have sold 33 homes constructed by students. Vandalia is located at 38°58′5″N 89°6′7″W﻿ / ﻿38.96806°N 89.10194°W﻿ / 38.96806; -89.10194 (38.568077, -89.101995). According to the 2010 census, Vandalia has a total area of 8.116 square miles (21.02 km2), of which 8.1 square miles (20.98 km2) (or 99.8%) is land and 0.016 square miles (0.04 km2) (or 0.2%) is water. Vandalia is situated on Interstate 70, U.S. Route 40 (the National Road) and U.S. Route 51. As of the census of 2000, there were 6,975 people, 2,344 households, and 1,425 families residing in the city. The population density was 1,231.3 people per square mile (475.8/km²). There were 2,543 housing units at an average density of 448.9 per square mile (173.5/km²). The racial makeup of the city was 95.57% White, 2.01% African American, 0.13% Native American, 0.30% Asian, 0.50% from other races, and 0.49% from two or more races. Hispanic or Latino of any race were 0.71% of the population. There were 2,344 households out of which 28.6% had children under the age of 18 living with them, 45.3% were married couples living together, 11.2% had a female householder with no husband present, and 39.2% were non-families. 35.1% of all households were made up of individuals and 17.2% had someone living alone who was 65 years of age or older. The average household size was 2.25 and the average family size was 2.90. In the city, the population was spread out with 18.3% under the age of 18, 12.4% from 18 to 24, 34.3% from 25 to 44, 17.9% from 45 to 64, and 17.1% who were 65 years of age or older. The median age was 36 years. For every 100 females, there were 134.4 males. For every 100 females age 18 and over, there were 144.4 males. The median income for a household in the city was $30,857, and the median income for a family was $39,762. Males had a median income of $27,342 versus $19,109 for females. The per capita income for the city was $14,918. About 8.9% of families and 15.6% of the population were below the poverty line, including 21.4% of those under age 18 and 13.8% of those age 65 or over. Vandalia is governed using the mayor council system. The council consists of eight members elected from one of four wards with each ward electing two members. The mayor along with the city clerk and treasurer are elected in a citywide vote. In Jules Verne's An Antarctic Mystery (1897), Dirk Peters, AKA Hunt, lived for many years in Vandalia before resuming his quest for his companion Arthur Gordon Pym. This novel is an imagined sequel to Edgar Allan Poe's only novel, The Narrative of Arthur Gordon Pym of Nantucket. The case of Frier v. City of Vandalia was a case decided by the Seventh Circuit Court of Appeals on the issue of res judicata. The case originally involved a parking dispute in Vandalia but became a pivotal case in civil procedure. Four US Navy ships have been named for Vandalia. ^ a b "Vandalia, Illinois History". Vandalia, Illinois. City of Vandalia. Retrieved 10 July 2015. ^ a b Allan H. Keith, Historical Stories: About Greenville and Bond County, IL. Consulted on August 15, 2007. ^ Allen, John W. (January 11, 1963). "Place Names Have Colorful History". The Southeast Missourian. p. 6. Retrieved 27 April 2015. ^ "Springfield's Long Nine". the New York Times. 1 December 1900. Retrieved 10 July 2015. ^ a b Power, John Carroll (1876). History of the early settlers of Sangamon County, Illinois : centennial record. Springfield, Illinois: Edwin A. Wilson & Co. p. 46. Retrieved 10 July 2015. ^ "The view from Vandalia: A half century on, a much-studied small city has lessons to teach". The Economist. December 22, 2012. ^ "BUILDING TRADES CLASS BUILDS 33RD HOME". WGEL. May 21, 2007. Archived from the original on August 23, 2007. Retrieved 2007-08-14. This page was last edited on 1 November 2018, at 14:38 (UTC).